You can make Hi5's in your company more visible by using our Stream view on the Wall of Fame. It's great to see public recognition happening in your company - a lively Hi5 Wall of Fame is an indication of an awesome company culture! Wouldn't it be great if anyone in the office (even clients!) could see this, too? It's possible with our Stream view! Connect a TV screen or monitor to a computer with internet access, or simply use your laptop/pc screen for your Stream view. Here's an article that might help you set it up. To start a live Stream of the latest Hi5's on your Wall, click on the View TV Stream link in the bottom right corner of the screen. 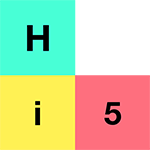 Tap the small, white arrows to click between Hi5's. To change the view to full screen, click on the full screen icon in the top right corner (it looks like a box). If you want to close your Stream view and go back to the Hi5 Wall of Fame, click on the 'X' icon in the top right corner. Now you are able to display your company's Hi5's in an eye-catching slideshow for everyone to see 👀 ! Click here to learn how to share a public stream of your Wall of Fame from any computer with an internet connection. Click here if you'd like to learn how to set up your TV view with a Raspberry Pi.